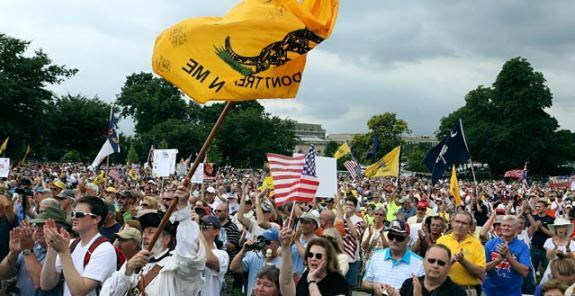 Jenny Beth Martin, leader of TeaPartyPatriots.org, has announced that on Wednesday, March 15, 2017 the Tea Party will be back in Washington for a rally at the U.S. Capitol. In an email to Tea Party movement activists and supporters Martin says it’s time for the Tea Party to go BACK to Washington, DC. President Trump is working to keep the promises he made on the campaign trail, but he’s running into opposition at every turn - from the intolerant leftist Democrats, to the mainstream media, and even some establishment Republicans. “It’s time for us to show up again in Washington and remind these politicians that it’s time to start enacting the agenda that will make America great again,” wrote Martin. Among the goals of the Washington rally will be to demand Congress confirm Judge Neil Gorsuch - repeal Obamacare - secure the border - cut taxes – and balance the budget within five years. On March 15th, we’re partnering with FreedomWorks to host a grassroots lobbying day on Capitol Hill. Office visits are one of the most effective ways to make our voices heard in Washington, D.C. and to hold our elected officials accountable. The committee hearing for Judge Gorsuch is set for March 20, which increases the importance of us being in DC together making our voices heard on March 15. I want to make sure it’s clear - we will hold a rally, but the major focus of our action for this day is to act as citizen lobbyists and visit Members’ offices in person. Wouldn’t it be great if we could flood their offices with supporters of the President’s nominees and agenda? If there is even a small possibility that you can make it to D.C. for this day of action, please do whatever you can to be there. Remember, when we show up, we win!! If you need anymore inspiration to show up on March 15th, take a look at this article about how local Democratic parties are swelling with new members and excitement, and check out the “resistance” website, complete with events they are holding in your area. The LEFT is showing up and it’s time for us to show up in even greater numbers! Jenny Beth Martin is right, save the date and we will send additional details as soon as they are available from Tea Party Patriots. Sounds like a PLAN ! . . . Submitted by email_registrat... on Mon, 02/27/2017 - 18:58.